The purpose of this tutorial is to introduce you to the “look and feel” of CDS. Use modes and layers (and their function keys) to control what is displayed on the active screen. Use a Query to find or alter the attributes of a point. Use the “join”hotkey to find the bearing, distance and grade between any two points. Open multiple windows to allow different “views” of a job. Display different jobs at the one time. The data will have been installed with the program installation. Note: It is not the intention of these tutorials to provide you with basic instruction in how to use Windows. If you do not already have a basic knowledge of how to use Windows to do the everyday things like; start programs, open folders, select files, minimize and maximize sessions, set up printers and print then it is reasonably pointless in trying to complete these tutorials. Please save yourself time and frustration by first undertaking some basic training so you are comfortable with the basic functions provided by your operating system before you attempt to undertake these tutorials. Once you are ready to proceed, select the Start button, then select Programs to display the list of programs available on your computer. Select CDS from that list, and a screen will appear as seen below. Alternatively double click the CDS Icon on your desktop. As you select these CDS files with a single click of your cursor, you will see details about the job listed in the relevant descriptive fields, allowing easy identification. The Job, or Database that we are interested in is job “970”, so highlight the file called “970.cdsdat”. The descriptions should indicate that it is data for Tutorial 1A, so double click “970.cdsdat” and the screen should appear as below. We can also open this file from within windows explorer. In this method we open windows explorer and find the data file 970.cdsdat Simply double click on this file and CDS is run and the file is automatically opened. Please note that the points in the job are not meant to represent anything like the jobs you will encounter in daily practice, but are merely an invented set of points designed to spell out TRPS, and to be used in this Tutorial. So, if you use your imagination, and can make out the letters of TRPS on your screen we are off to a good start, so let’s explore what functions are available. Firstly, if you look from the top of the screen, you will see the second line is the Menu list that contains the various “drop down menus” you will learn to use to complete your tasks. Below the menu list are two rows containing a number of icons, and these icons can be used to give you quick access to commonly used functions. If you run your cursor slowly over the icons, a window will appear on the end of your cursor arrow telling you what each icon accesses, so take a few moments now to position your cursor over each icon in turn to get the idea of what they do. The first function we will explore is the Zoom function which allows you to control the size of the job, or more correctly, how much of your current job is displayed on the screen at any given time. If you have a wheel mouse you have access to dynamic zoom and pan. Rotating mouse wheel will dynamically zoom in or out. Holding down the mouse wheel and moving the mouse will automatically pan the display. Press the “Z” key on the keyboard. Once you either select the icon or press “z” you are in Zoom Mode, and more particularly, you are in Zoom Window mode, and your cursor will have changed to a magnifying glass. The program is now waiting for you to place a Window around the area you are interested in. To do this move your cursor to where you want one corner of the window to be, and hold down the select button (normally the left one) on your mouse. With the button held down, move the mouse to drag the window until it envelopes the area you wish to see at a larger scale. 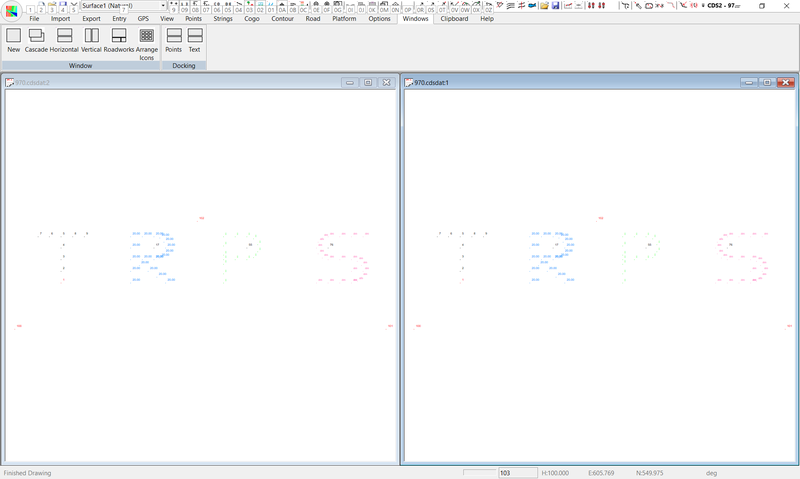 For example, in the screen below left you see a window around the “T” and “R” in this job, and in the screen on the right you see the screen which is presented once the button is released. Please notethat the program takes the dimension of the window you specify and then expands that in whatever direction necessary to fit the active window. In this case, the vertical dimension of the window shown has been used to fill the screen, and there is room in the horizontal direction to also display the points in the letter “R” as well. Don’t be confused by those programs that allow you to put a window around something, and then only display the contents of the window on the screen, that is not the intention here. The other function currently available within zoom is to reverse the effects of the Zoom Window, and to again display the whole job in the active window. 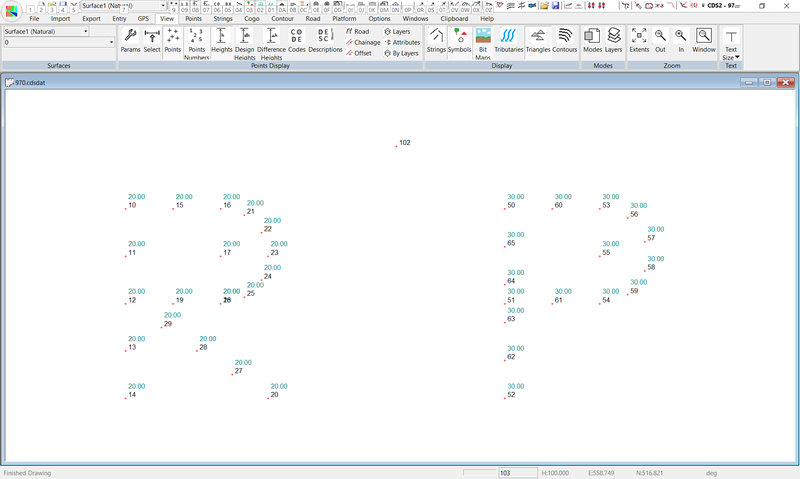 To achieve this you wish to Zoom Extents, so when you activate Zoom (either from the icon, or pressing Z) immediately press the “E” key to indicate Extents are required, and the screen will be redrawn to show all the points in the job within the active window. You can also enlarge the size of the job, or zoom in with the ‘+’ icon, or you can reduce the size of the job, or zoom out with the ‘-’ icon, and you should try them to see what they can achieve for you. If you have a wheel mouse you have access to dynamic pan. Holding down the mouse wheel and moving the mouse will automatically pan the display. - Select the Icon with 4 arrow heads on the toolbar (seen above). When you enter Pan mode, the cursor will change to be a cross bearing 4 arrow heads as seen above. All you need to do to Pan is to put the cursor near the point you wish to move, press the left mouse button, and hold it down while you ‘drag’ the cursor to where you would like the point to be. For example, in the screen below left we have positioned the cursor near Point 12 in the “R”, then dragged across to near the left hand border, and down a little from horizontal. You will see a line drawn to show where the item will move. When you release the mouse button the screen will be redrawn in its new location, as seen in the screen shown below right. 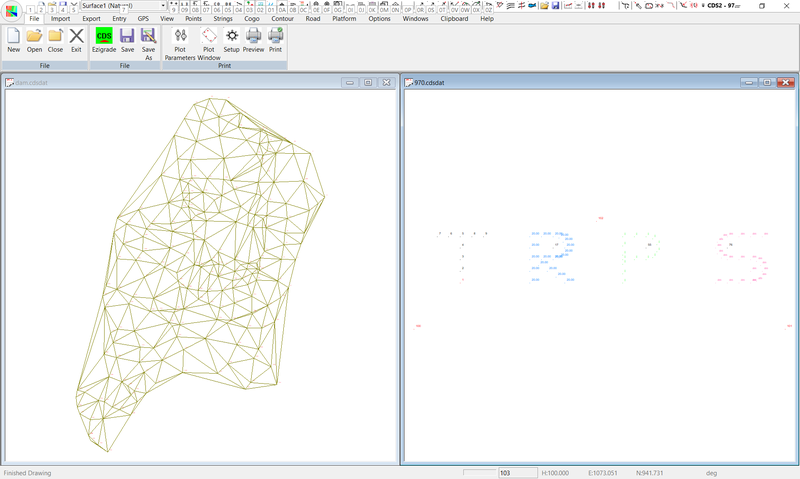 Now that you know how to control the extent of the data which is displayed, next you need to consider how you can control what is shown on that display at any point in time as far as the attributes of the points, strings, contours and triangles are concerned. The combined effects of the Modes and Layers functions control the Display, and first we will consider Modes. For a dynamic pan you need a wheel mouse. Hold down the wheel and move the mouse in the direction you wish to travel. The display will pan appropriately. Simply release the wheel to finish the dynamic pan. You may access the Modes function by selecting its icon, or by pressing the F9 function key. The modes icon is the one to the right of the Zoom icon and it represents a screen display controlling how the job will appear. When you select the Modes Icon, or press the F9 function key, the screen on top of the next page will appear. If you look at the first two options available, you will see that the Display can either be controlled by Layers, or by Modes, and while the program gives default control to the layers, there are times when your data is not conveniently arranged in layers, so it is important that you know how to take control over what is displayed. To give you an example of what you can do, click the radio button adjacent to Modes to indicate that you wish to use the Modes function to control the display. Next select the “ON” button adjacent to heights to indicate that you want the heights of all the points displayed. Now select “OK” at the bottom of the screen. The screen will now appear as at right, and you should notice that heights of all the points are now displayed rather than the point numbers, and the text is now all the same colour. If you wish, you can again call up the Modes screen and turn Point codes ON. Alternatively, you can also use the function keys which were established in previous versions of Foresight to turn various attributes On/Off. The Function Keys and their attributes are as follows. Please note that there are a limited number of function keys available, and they have been assigned to the most commonly displayed items. 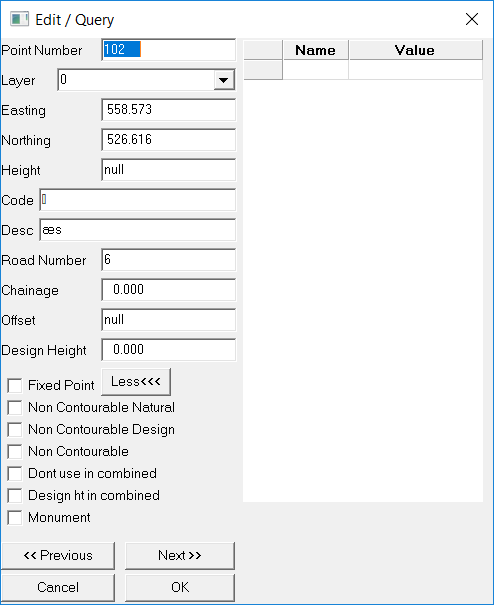 If you wish to display Description, Layer Names, Road Number, Chainage or Offset there is no function key available so you will need to use the modes screen to turn these items on or off. You should also be aware that the Modes function is also designed to display only one attribute at a time, so you can either have Point Numbers displayed, or you can have Codes displayed etc, but you can’t have some Point Numbers and some codes. To do that you need to use layers. You can however use the Select option from the modes screen to limit the display to a specified range of point rather than all points in the job. 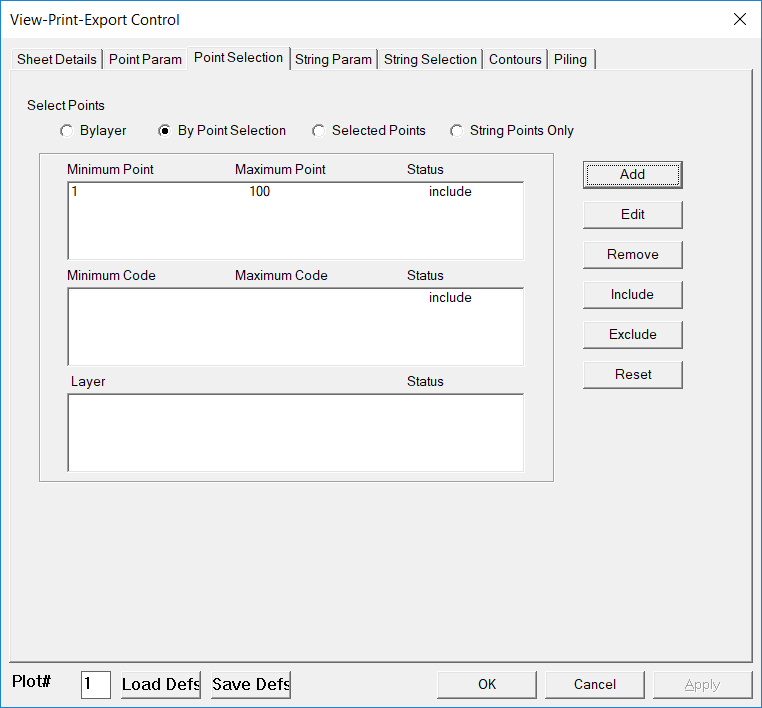 But if you look at the screen you will see there is only one Select range, so the attribute currently turned on will be displayed for the range of Points you have specified. This function was not designed to allow you to display different attributes for different ranges of points. That ability is handled by layers which we will now introduce you to. Before you proceed, please press Z followed by E to display the entire job. The Layers icon that is shown at left, can be found to the right of the Modes Icon, and the layers screen can also be quickly accessed by using the F10 function key. When you select layers, a screen similar to that at right will appear. Here you will see that there are six different layers in the current job. If you do not assign points to a particular layer they will all be placed on a default layer of 0. Before you start tinkering with the screen, remember that the Modes screen has ultimate control over whether the display takes notice of the Modes or the Layers parameter screen, and since we have just finished using Modes to control the display, we need to switch it over. Select the tab marked “Modes - Display” and turn on the Layers button. Then select the Layers tab to bring back the screen above. To get some idea of the capabilities of this Layers function, we will first turn layer 0 and layer “Centre” OFF so they are not displayed. To do this, position the cursor over the light bulb on the appropriate line. Left click the mouse and the light bulb will be dimmed to signify that the layer is no longer displayed. Note you can also select a number of layers at the one time by “dragging” the mouse over the layers to be selected, but we will leave you to practice this function on your own. 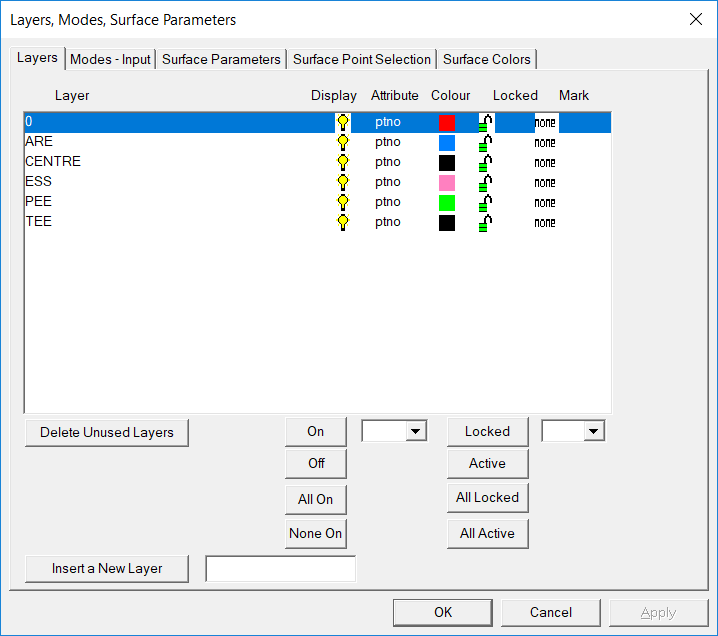 Once you have turned 0 and centre OFF, Select layer “Are”. Then use the pull down option to choose to display the Height (hgt) for this layer. Now select layer “Pee” , use the pull down option and scroll through the list to assign the “code” to be displayed. 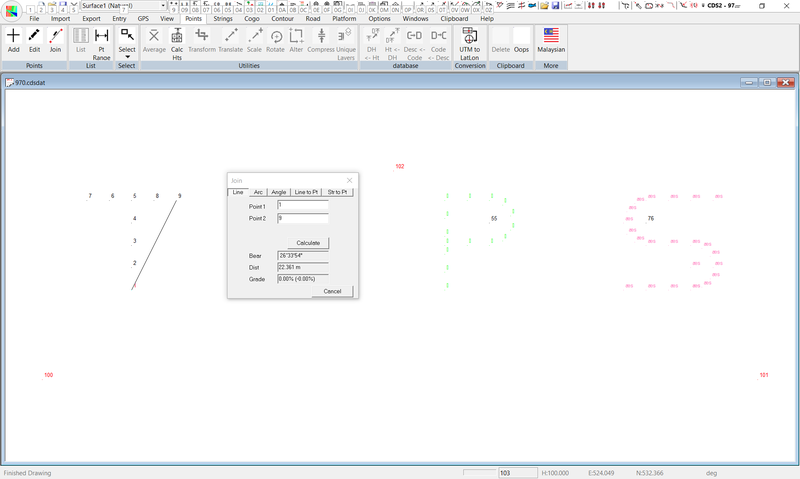 Next select layer “Ess” and assign the attribute of “desc” to display the description. If you wish, you can also assign different colours to each of these layers to make identification or differentiation easier, but though you can see the difference on the screen, since this tutorial is printed in black and white, the different colours will not reproduce here. Once you have made the relevant selections select the “OK” button and you should see a display as below. As well as allowing selection of which attributes are to be displayed, the layers function allows you to display only those points in which you have a current interest. So, for example, call up your layers screen again, turn off all layers except “TEE” and “PEE”, and the screen should appear as below. Hint: One way to achieve this with a minimum of actions is to select “None On” to turn all layers off with one action, and then select Tee and turn it on, and then Select Pee and turn it on. 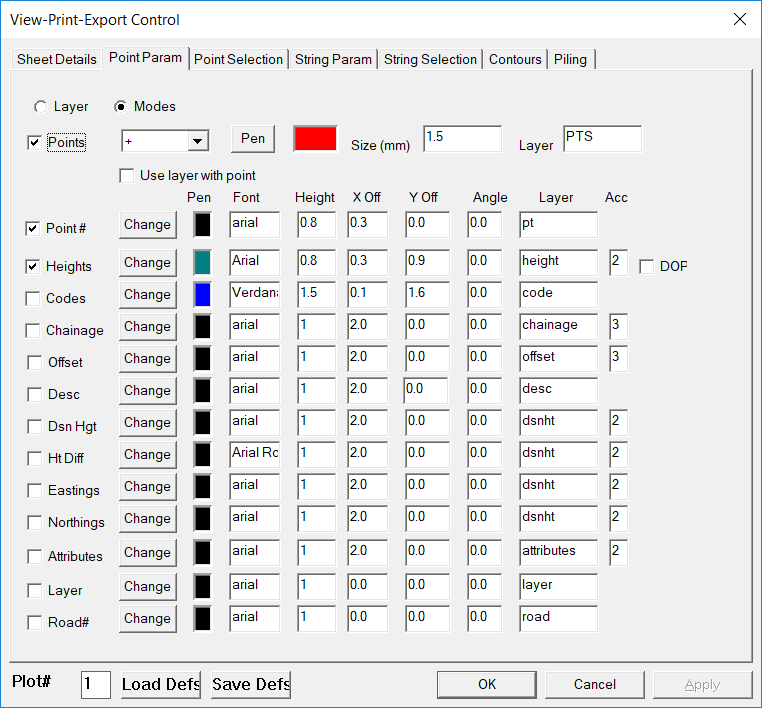 The standard Windows method of selecting items using Shift Select for Groups and Control Select for individual items is applicable in the Layers function. The next Icon displayed on the menu bar is in the form of a question mark, and if you have a question about any particular point, or wish to change a particular point, you can select this icon, or enter “?” from the keyboard. You may type in the number of the point you are interested in, or point to it with the cursor, and its details will be displayed. A line will also be drawn from the bottom left hand corner of the window to, or towards the point to indicate its location. In addition you can use the “Next” and “Previous” buttons to scan forward and backward through the database. If you wish to alter the values of a point, you can position the cursor in the relevant field, and type in the value you require. The function will NOT allow you to change the point number of a point, but you can alter any of the other database fields, so please be careful and make sure you know what you are doing before you start. If you do change any of the values, once you select the “OK” button you will be asked to verify that you wish to save the changes which you have made, and you must select Yes if you wish the changes to be made permanent. The Join function does not have an icon, and is accessed by pressing the “J” key on your keyboard. This is one of the “Hot Keys” which you need to remember to make use of the software easier. If you select Points 1 and 9, the bearing and distance between them will be displayed as seen in the screen at right. If both points have valid heights. then the percentage grade between them will also be displayed. You will also see a line drawn on the screen between the points. Once you press J, you will find a “Join” Dialogue Box appears as seen in the screen at right, and the box is requesting a First Point and a Second Point. You may type in the Point numbers of the relevant points, or you may select the points you require by pointing to them with the cursor. To select the point, simply place your cursor (the tip of the arrow) over the point attribute that is displayed and select it with the left button on the mouse. In some cases it is useful to have two (or more) different views of a particular job, and this can be easily achieved as shown below, but before you start, use your Layers function again and turn all the layers On. First pull down the “Window” menu from the menu list, and select the “New Window” option. You will see a second window appear with your job displayed in it, and when it appears it is “cascaded” over the existing window, partly obscuring the first window. 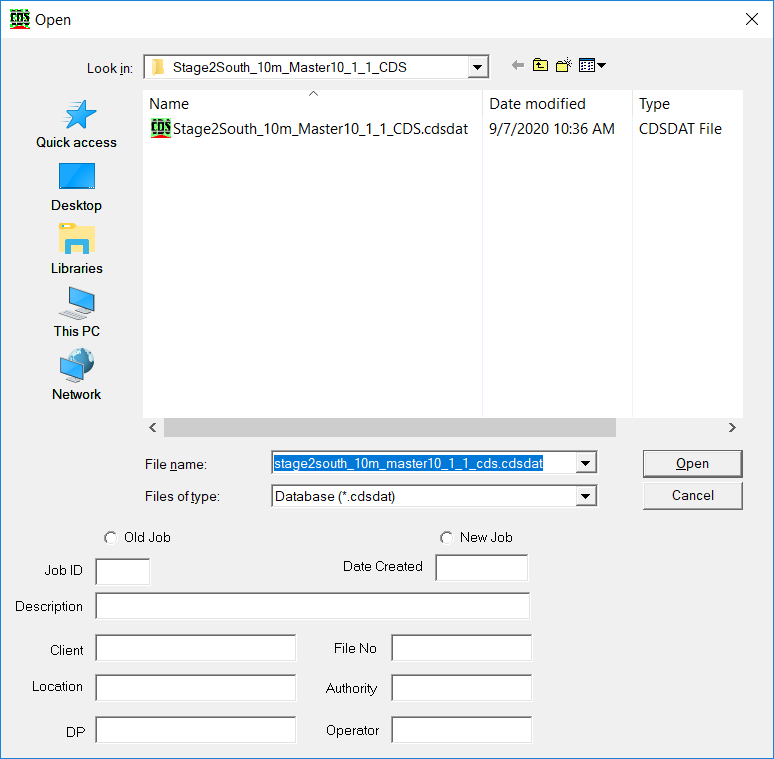 So you can see the contents of both windows at the one time, CDS has function to allow you to “tile” the windows, and because jobs are of different shapes, you have the ability to tile either vertically or horizontally. If you again pull down the Window menu and select the option to Tile Vertically, the screen will appear as in the diagram below left, while if you choose to Tile Horizontally, you screen will resemble the screen below right. 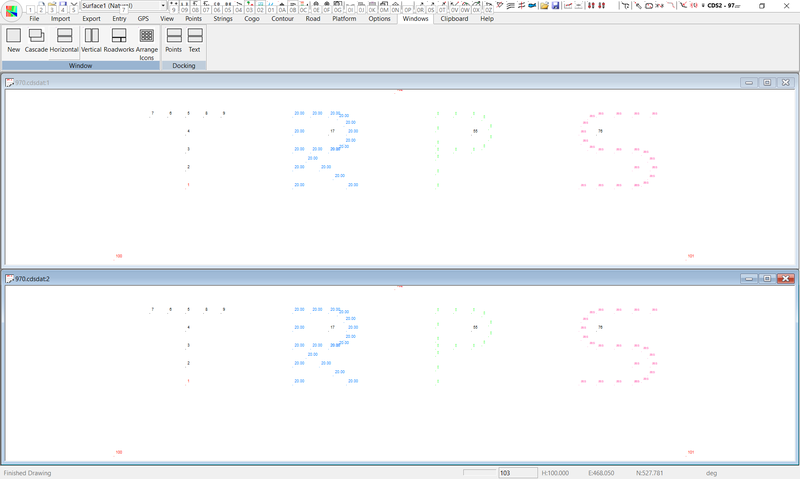 If you Tile Vertically, and then Zoom a window around the “R” shape in the job, you should see a screen as below left. or more windows open at any time, only one window can be active at any given time. The active window can be determined by looking at the “bar” along the top of the window. 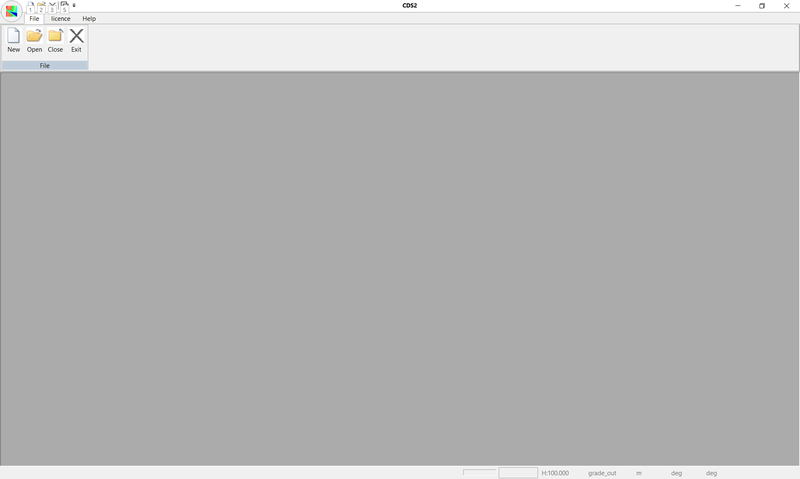 One will be coloured, while the other will be “greyed out”, and the one which is coloured is the active window. If you wish to switch to make the other window active, simply position the cursor within the window and press your left mouse button. You will see the “coloured bar” changes to indicate the new active window. Any changes which you make as far as Modes or Layers are concerned will take effect immediately in the active window, but will not become apparent in the non-active window until it is redrawn. You can use this feature to give yourself a simultaneous display of two different attributes of the points on display. To achieve this, you use the “New Window” function three times to create three new windows, and then use the Tile Vertical command to set the four “panes” in place. 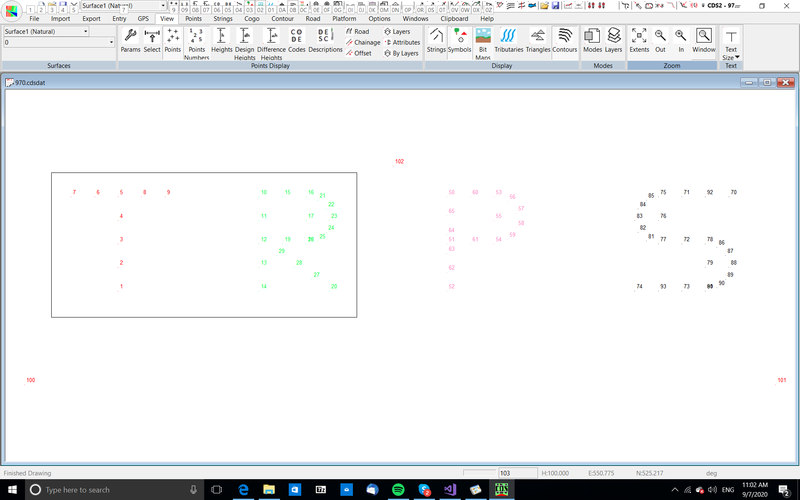 For example, in the screen at left we have the display in the right hand window controlled by Layers, while in the Left hand window we have zoomed up the area of the “R” and then used Modes to display the point numbers of those points in the active window. To extend this concept a little further, if you look at the screen displayed below, you will see four windows. You then make each window active in turn, and while the window is active use the Zoom command, and/or the Modes/Layers function to control what is displayed in each window. So far we have concentrated on different views of the one job, but you should be aware that it is also possible to display different jobs at the same time. To achieve this, open your first job as normal, and then use the File Open command to open the second job you are interested in. This will automatically open the second job in a new window that will be overlaid over your first job. Then you use the Window menu and either Tile Vertical or Tile Horizontal depending on the shapes of the respective jobs. 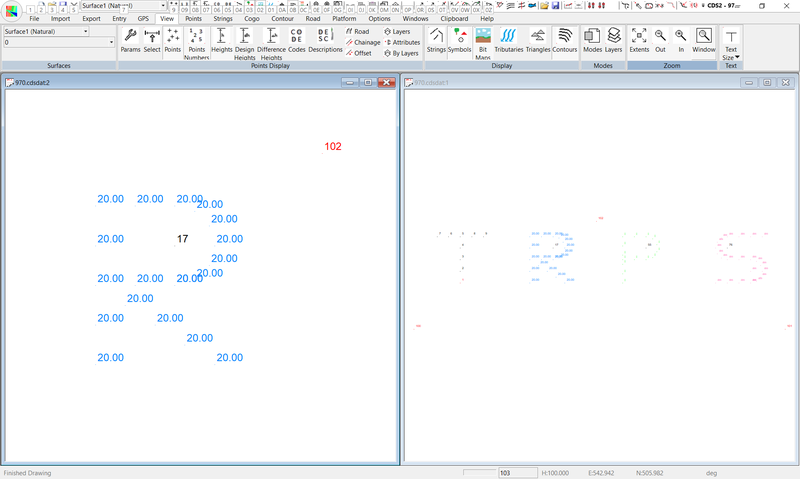 The screen adjacent shows an example of what can be achieved with job 970 in the left window and job DAM in the right window. Please Notethat just because the function to open different jobs is available, it does NOT mean that you should use it every time you come to the computer. It is a fact of life that if you have two jobs open at the one time, the speed of processing of each of the jobs is necessarily degraded over the speed achieved with only one job open, so use the function when you need to, not just as a matter of course. If you are not completely comfortable with your ability to work within Windows, to maximise and minimise windows, to alter the default printer, to open and close files and windows then please save us, and yourself, a great deal of heartache and frustration by taking the time to now become comfortable with these items before you go on.